The video recording spy watch is real! If you're one of those people that love a bit of snooping action at the weekends, then have we got the gadget for you. 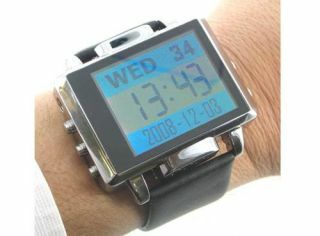 The Thanko MP4 Spy watch might look like a chunky wrist-piece, but it also shoots covert video too. Not only that, but it can take digital stills, play MP3s and video and even playback photos as well. While it might not work with today's minimalist outfits, taking video at 352x288 resolution and pics at 640x480 in a watch is something we just can't help but like. However, this is one of those 'Damn you Japan, why did you get it first?' gadgets, costing roughly £100 at today's rates. But never fear! Most Thanko gadgets make it over the land and sea to the UK at some point or other, so just sit and wait. Or go out and do something else, it's up to you.